Unit Measure Speed "Km/h" / Power "ps"
The BLITZ electronic Racing Meter DC (Digital Compact) II series are one of the most unique gauges on the market. Succeeding its predecessor, Racing Meter DCII maintains the traditional dimensions and versatility of the Digital Compact Series features a depth of less than 1-inch and weighing 38 grams, the BLITZ Racing Meter DCII can virtually be mounted anywhere in the vehicle. 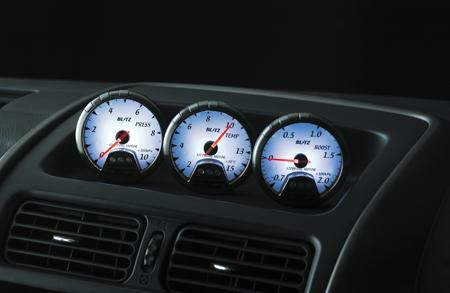 Available in boost, oil/water temperature, oil/water pressure, speed/power and exhaust temperature/Rpm, the BLITZ Racing Meter DCII is renowned as the most complete set of compact gauges available on the market. Available only in 60mm, BLITZ Racing Meter DCII gauges come is available in carbon, white, and blue.